Do you want to obtain a brighter smile? Over time, our teeth can become dull due to the onset of discoloration, often as a result of the foods and drinks we consume. Fortunately, we have treatments to help brighten smiles in 2017. Do you want to obtain a brighter smile, one free of unsightly discoloration? 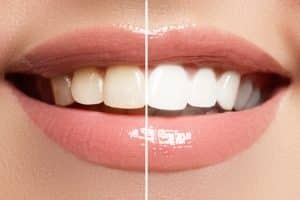 Teeth Whitening: If you prefer a single visit solution, we can apply a powerful bleaching gel to the teeth, which is activated using a curing light, removing stains in one sitting. We can also send you home with trays and a bleaching gel. The at-home version involves wearing the gel-filled trays for between one and two hours daily over the course of a week to ten days. Finally, for serious cases of discoloration we can combine our office and home-based treatments. Porcelain Veneers: With this option, we place a thin restoration that covers the front and sides of a tooth. Made from lifelike porcelain, the restoration is strong and blends with the smile seamlessly. We can use them to mask teeth stains, reshape malformed, worn down, or damaged teeth, and close gaps between teeth. They can also be used to correct the appearance of minor misalignment. Dental Bonding: We can also repair teeth in a single visit with bonding. The procedure involves placing a composite resin onto the tooth and curing it in a light. We then polish the tooth thoroughly for a more lifelike appearance. We can repair chipped teeth, close gap between the teeth, and mask permanent teeth stains. If you have any question about these or any of our other cosmetic treatments, then please contact our office today.